Donating to the Mali Elephant Project makes you a part of an international team – spanning ethnic and national boundaries – mobilizing to save this unique herd. Your gift transforms the effectiveness of local brigades and patrols, bolstering their capacity to safeguard the elephants. On behalf of these brigade members and the elephants they work to protect, thank you! 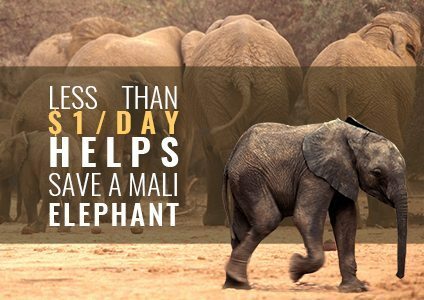 For less than a dollar a day, you can be a part of the solution that will save an elephant herd in Mali. Support the local patrols that are working daily to stand up to poachers, and be a part of an international effort to ensure that the last remaining elephant herd in North Africa is safe for years to come.